A denture is a removable dental appliance that replaces missing teeth and surrounding tissue. Dentures are made to closely resemble your natural teeth and enhance your smile. They improve chewing, speech, and digestion. There are two types of dentures – complete and partial dentures. 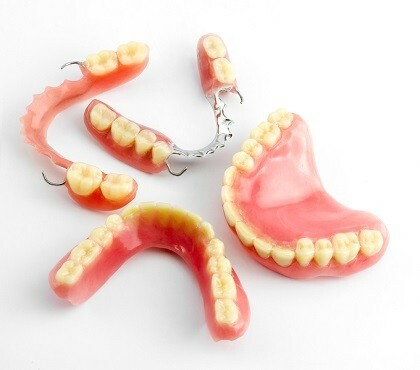 Complete dentures are made when all of the teeth are missing. Partial dentures are made when some natural teeth are present. The partial is attached to these teeth for stability. A partial denture not only fills in the spaces created by missing teeth, it prevents other teeth from shifting. The process of getting dentures requires several appointments, usually over several weeks. Highly accurate impressions and measurements are taken and used to create your custom denture. Several appointments are necessary to ensure proper shape, color and fit. At the final appointment, your doctor will precisely adjust and place the denture, ensuring a natural and comfortable fit. Following the fit of your denture, subsequent appointments will be made to adjust areas that might get sore with use. It is normal to experience increased saliva flow, some soreness and possible speech and chewing difficulty. However, this will subside as your muscles and tissues get used to the new dentures. You will be given care instructions for your new dentures. Proper cleaning of your new dental appliance, good oral hygiene and regular dental visits will increase the life of your dentures.